As many as 1,000 people are feared dead after a magnitude 7.2 earthquake struck southeastern Turkey, resulting in the collapse of around 50 buildings in the province of Van. At least 85 people have been confirmed dead after the quake struck at 1.41pm local time (11.41 BST), with the highest number of casualties coming from the city of Ercis, a city of 90,000 some 13 miles from the epicentre Tabanli and more than 36 miles north of the provincial capital city of Van. The state hospital reported 59 people had died and more than 400 injured were being treated four hours after the quake struck. 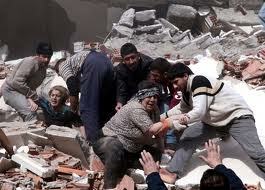 The area was also hit by a series of aftershocks.